Game of Thrones fans can now own their own Jaime Lannister Figurine. This figurine shows Jaime as we know him in his armor ready for battle and yes he did bring his sword too. 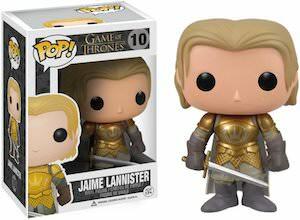 And this Game of Thrones figurine is part of the Pop! series from Funko and the box has number 10 on it. The figurine of Jaime Lannister is 3 3/4 inches tall and will look great as part of your Game of Thrones collection and it works out of the box or you can keep it in the box so that it keeps looking new as it has a nice window in the box.